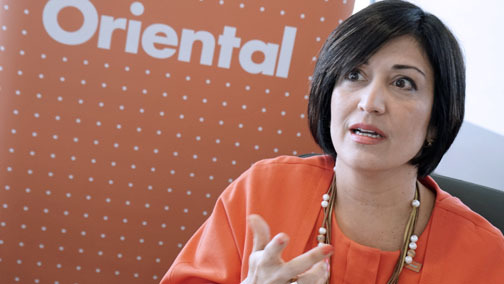 Idalis Montalvo, vice president of marketing and public relations at Oriental. Oriental Bank announced Tuesday the second phase of its institutional campaign called “Vive,” a $1.5 million marketing and advertising effort that extends the theme that has identified the financial institution for the past several years. The new phase follows the “Vive la Diferencia” effort and will be in place and evolving for at least a year, said Idalis Montalvo, vice president of marketing and public relations at Oriental. The “Vive” campaign intends to acknowledge the differences in human aspirations and opportunities that arise every day. The campaign recognizes the value of those who aspire to achieve more, who are non-conformist, and are looking for different ways to achieve their goals, she said. “At Oriental, we’re very excited about the message the campaign carries because it communicates the value we give to every client and recognizes our innovative spirit to serve in a different and unique way,” she said. “It reaffirms our commitment to finding new ways to make life easier while recognizing the value of customers who dare to take a new look into their future,” Montalvo said. “So this time we decided not to use actors but real life people showing their differences with naturalness and genuineness,” she added, of the multi-platform effort that will run on television, print and digital media, among other outlets. “At Oriental, we believe in the ability of everyone to make progress and that’s why we offer an unparalleled service experience and technology solutions for their convenience. We recognize the differences in our customers, we value them and believe that’s what makes them valuable,” she added. “Oriental Biz” and service that allows customers to make an appointment at the branch via the website to request a personal loan, among other services. The executive also said that internally, Oriental carries the same message to its nearly 1,500 employees. “Our vision is to be a bank where our people have a purpose to serve and make life easier for our customers. That’s why we encourage our employees to always aim higher and make a difference, since each of their contributions add to this common goal,” Montalvo said. Markham & Stein Unlimited was in charge of the creative concept, and the campaign was locally produced entirely by Nostrom Group. Starcom MediaVest designed the media strategy and digital agency Pixelogic is leading efforts on social platforms. Hey Buddy!, I found this information for you: "Oriental unveils ‘Vive’ institutional campaign". Here is the website link: https://newsismybusiness.com/oriental-institutional-campaign/. Thank you.